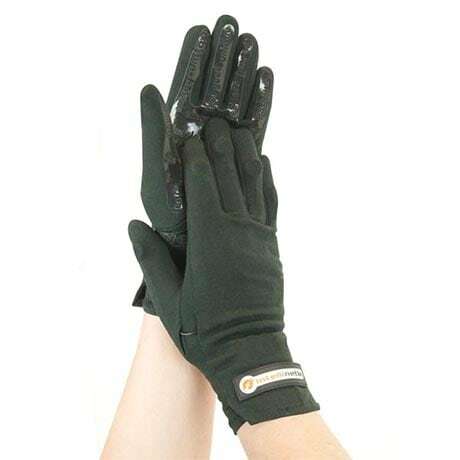 Vibrating Gloves Help Relieve Arthritic Pain & Stiffness These breathable and comfy cotton gloves feature gentle vibration that helps quiet the ache of arthritis, hand swelling, and joint discomfort. Tiny cells inside each finger subtly pulsate, encouraging blood flow to painful areas and warming achy joints. Vibrating Gloves have mild compression to further stimulate circulation. Anti-slip silicone palms. Wear indoors or out. Turn gloves on/offas you please. Includes power adapter and a rechargeable battery in each glove. 92% Cotton, 8% Spandex. Spot clean. Black. For size, measure length across knuckles: SM (up to 3 1/8"), MD (3 1/8"- 3½"), or LG (3½"- 4"). If borderline, order down.